Our first day in Florence we did a custom Context Travel tour, Florence for Foodies. During that tour, one of the stops was Procacci, a historic deli founded in 1885, which specializes in products with truffle. 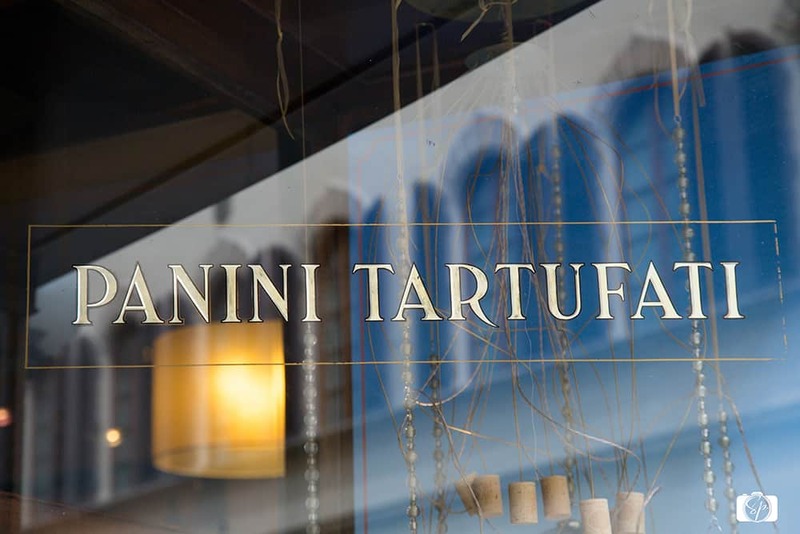 During our first visit, we tasted the house specialty, Panini tartufati, a small sandwich with a special truffle cream. The recipe is top secret (they even have a sign that says so!). I would define Procacci’s as a wine bar, one that is loved by tourists and locals alike. In the afternoon it is super crowded with ladies having an afternoon out with their girlfriends, gossiping over a glass of wine or prosecco and little apertivo before heading home. Procacci’s is a Florentine institution run by the Antinori family, a very old wine family in the region. It is located on a very chic street amongst small boutiques and it feels very luxurious to sit inside and people watch. Despite this feeling of richness and grandeur, there is nothing pretentious about the people that work there, they are friendly and helpful, even when you try to steal their recipes as Mr. Misadventures tried to do (despite the sign…ah the French!). The prices are very, very reasonable as well, which is surprising considering the neighborhood. A couple of days later we were headed to lunch at Obika Mozzarella Bar (more on that spot soon) but were early, so we stopped in for a pre-lunch sandwich (truffle and salmon) and prosecco…doesn’t everyone do that? A bonus is that you can purchase truffle products to bring home and extend your trip. Anything with truffle is a powerful reminder of Tuscany and Mr. Misadventures and I bought several items to make our memories last longer. If you’d like to visit Procacci Florence, it is located at Via Tornabuoni, 64/r. How about you? Have you had truffles? How have you had them or would you like to have them? Do tell! The food & wine in Italy sound heavenly! Would love to travel there some day! @Karen, it is pretty amazing and the Italians think it is the best in the world, I hope you get to decide for yourself one day! So want to taste truffles!! The food & wine in Italy sound heavenly! Would love to travel there some day! @Karen, it is definitely a mind-blowing experience. I had only had them once before in France, but it was a very dilute preparation – this time it was so in-your-face it was a truly awesome experience! @Krystel, it is, it is! OMG I FOODIE VACATION! I need to sign myself up for one of those!!!!! 🙂 I am drooling! @Gigi, no matter way to visit a city then through your stomach! Love the vacay pics! I miss Florence! We were just in Florence a few weeks ago but I didn’t know about this cafe at the time… will have to check it out on our next visit! @Lavende&Lemonade, what did you do while there? I didn’t know about this spot on my last trip either! I’ve never heard of truffles on bread before – but hey… sounds freakin’ delicious to me, I’d give it a try. My gosh, I am SO jealous of your adventures! I can’t wait to go back to Europe someday! @Chelsea, what are your other favorite parts? Florence is my favorite city. The Duomo with its crazy loud bells… I’m so envious of you right now. @Sinova, I hope you get overseas as well, but there are so many adventures to have here as well! I’m loving all of these travel food shots! Thanks for sharing! @Brenda, thanks I am glad you enjoyed them! @Kelsey, it is so true, just like houses or businesses, location…location…location! You’re seriously making me want to return to Italy on holiday, not just for the sun and the beauty but the fabulous food and wine too! @Fi, where did you visit on your trip? Amazing! I’ve never been to Italy but I would love to go! @Gillian, I hope you get there! Your photos and descriptions transported me to Italy. It looks like an amazing experience. @Tammi, I am so glad my post could do that! Ooh, those pictures make me want a big glass of wine! Looks delicious! @Kendall, yes! Wine is a must! I seriously love reading about your adventures and wanting the yummy food you experienced! @Amby, thanks so much! I am glad I can inspire you! Have you cooked with truffles in your culinary adventures? That food and wine look amazing! I WILL one day make it to Florence! Hope you had a fantastic time. @Angela, I hope you get there! Ooooo travel. I love this. I wish I had more money so I could travel the world! Great pictures! @Alyssa, I hear ya! I am all savings up for my next trip! @Linda, it was a really great spot. That’s it. Now I have to pack my bags and head back to Europe ASAP! I haven’t been to florence yet… it’s on my list! @Susan, it is fabulous! I highly recommend it, and I’ll join you on the packing the bags and heading back part! @Jemma, what was your favorite thing? I love truffle. I had truffle gnocchi in Leeds at the weekend on a fab rooftop bar and it was so delicious! Very heavy though, but perfect cosy, comforting food! @Katie, never heard of it with gnocchi, that wounds divine! I’ve always wanted to go to florence. This looks amazing! @Rebekah, any particular thing you would want to see, do or eat? I’ve never tried anything with truffle, but I do watch master chef, haha so I’ve heard about it. i’ll have to try it one day! @Erica, if you get the chance to try some, definitely do! @Jessica, is it one of my favorite places to be, I hope you get there one day! I did a big tour of Italy last summer but we never made it to Florence and I’m SO sad about that! 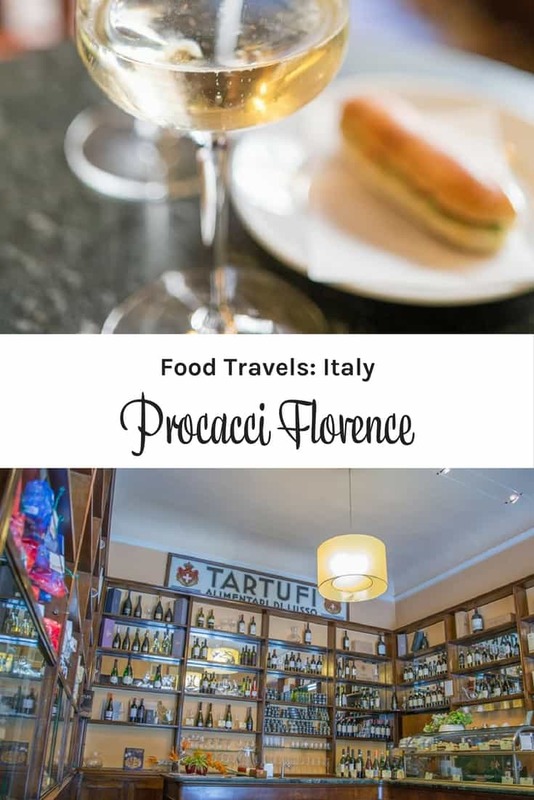 When I do make it to Florence, I TOTALLY want to do a Foodie tour. That sounds amazing!! @Brita, where spots did you get to? Happy you found this place Andi, and I have no doubt that your tour with Context was awesome, they are my favorite in the city! 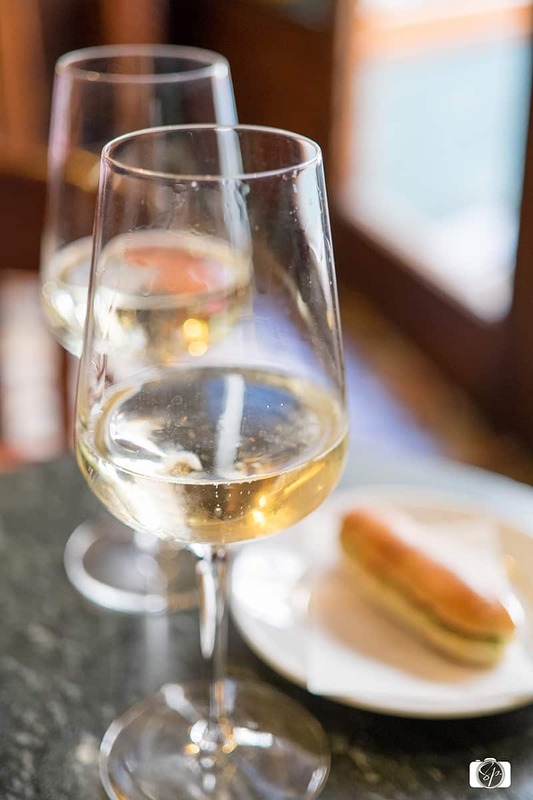 Whenever people come to visit, I always take them there for a glass of prosecco and a truffle bite, two or who are we kidding, even three! ;-). Let me know next time you are in town and perhaps we could meet up, love your blog! @Georgette, I can imagine visiting there several afternoons a week if I lived there! It is not my last time to Florence so I will definitely keep you in mind for future trips! Andi I hope you do! I am a huge fan of photo walks with spirited beagle puppies (mine) ;-). @Georgette, I saw your pup on your blog this morning – adorable! I’ve had many different truffles in life. 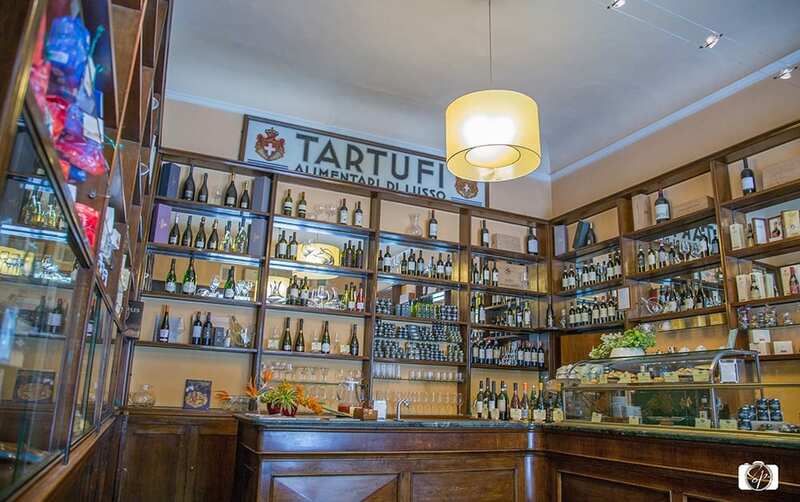 The best yet has been the one known as “tartufi neri” in Italian, black truffles that are usually found in the regions of Umbria and Piedmont.